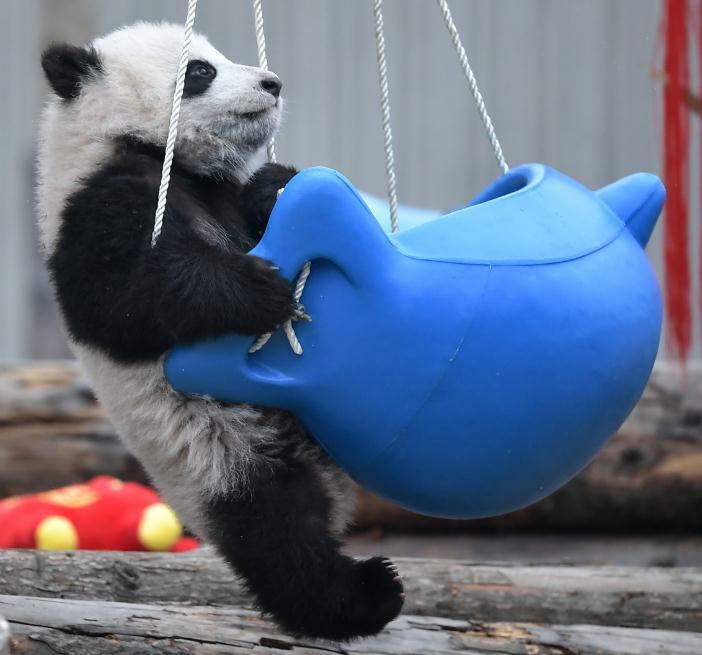 China has started putting greater emphasis on improving pandas' genetic quality and biodiversity instead of merely increasing the population, according to a senior specialist known as "Panda Mama". The specialist, Hou Rong, chief researcher at the Chengdu Research Base of Giant Panda Breeding in Sichuan province, told China Daily about the shift last week during the annual two sessions. She's also a deputy to the National People's Congress. Hou has spent most of her time trying to increase the number of pandas since joining the center in 1994. It is now home to 195 captive pandas. Panda reproduction is no longer a major challenge. "Almost all baby pandas at the base survive, as long as they are healthy at birth," she said. Priorities needed to change, Hou said. "With 548 captive pandas nationwide, we will maintain the current growth rate, or lower it properly. We will turn to improving captive pandas' genetic quality. In other words, we will fully protect panda biodiversity," she said. The national total is believed to support a self-sustaining panda population. While boosting numbers was the priority, a captive panda at a research center in China was the father of some 100 captive pandas. However, Hou said, that does not help with biodiversity. Hou said public awareness of animal conservation in China has increased over the years－whenever she has appeared at public events, journalists always want an interview about pandas. While the Chengdu center used to be visited mainly by foreigners, the overwhelming majority of visitors now are Chinese. On a single day during the three-day May holiday, 80,000 Chinese flocked there. Hou, who has served as an NPC deputy for 12 years, was the first deputy to ask for enactment of a law to establish the Giant Panda National Park to ensure joint efforts to protect wild pandas and other species in the park. There are many nature reserves and scenic spots in the boundaries of the park that are under the administration of different agencies. Without a law, they might not work together as well, Hou said. Planning for the park began in January 2017, when the general offices of the Communist Party of China Central Committee and the State Council issued a notice on the project. The park covers 27,134 square kilometers in three provinces, with 20,177 sq km in Sichuan, 2,571 sq km in Gansu and 4,386 sq km in Shaanxi. Establishing the park primarily in habitats of wild pandas is of great importance in protecting the ecosystem and biodiversity, with pandas at the center, Li Chunliang, deputy chief of the State Forestry and Grassland Administration, said at a ceremony at the park's administrative bureau in Chengdu in October. In her first 10 years as an NPC deputy, Hou poured a great deal of research into writing a 50-page motion asking for revision of the country's wild animal protection law. Some of her suggestions, such as protection of wild animals in captivity, were adopted in the revised law, which took effect on Jan 1, 2017. Before the law was revised, there were no provisions pertaining to protection of wild animals in captivity. That led to incidents such as a university student who was reported to have poured sulfuric acid on five bears at a zoo in Beijing in 2002 and captive tigers that were starved at a zoo in Shenyang, Liaoning province, in 2010, Hou said. China has started putting greater emphasis on improving pandas' genetic quality and biodiversity.